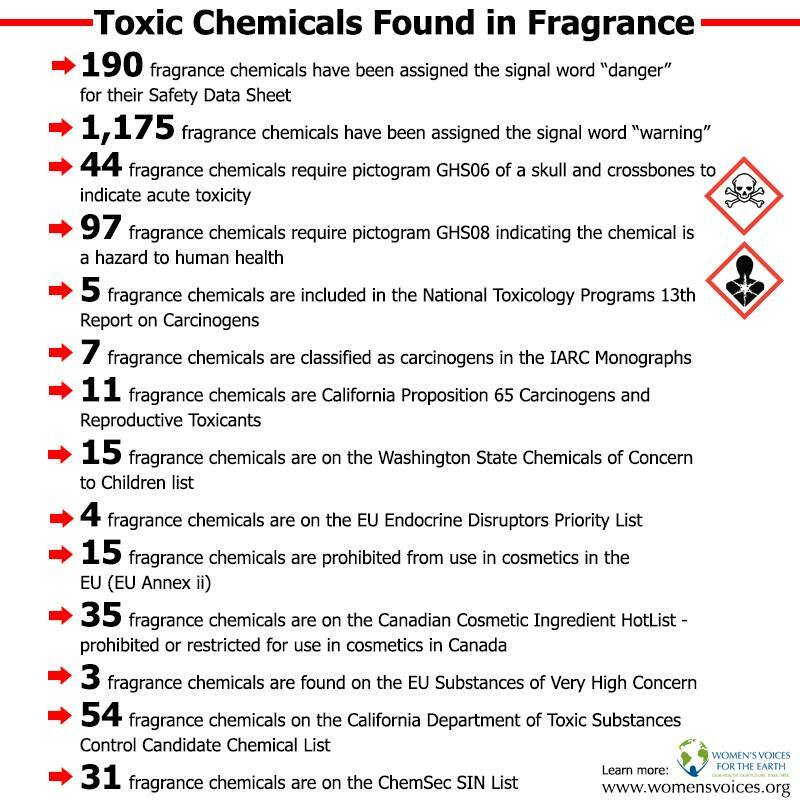 “Unpacking the Fragrance Industry: Policy Failures, the Trade Secret Myth and Public Health“. It’s must read material if you are at all unfamiliar with the issues surrounding fragrance. And that’s only the ones that have been tested. Many have not been tested for human health effects. Scientists also recently discovered that chemical cocktails can become carcinogenic even when individual chemicals themselves weren’t carcinogenic, but chemicals are tested individually (if at all), and not in the cocktails we get exposed to. Please read the research and articles from WVE, and then take action. “Fragrance Industry Responds to Our Report on Safety Policy Failures“. Also, not surprisingly, the industry didn’t mention how much money they spend lobbying the US government against being regulated in any way shape or form. Nor did they mention that their members are manufacturing products to deliberately target our brains, using secret chemical concoctions, without any regulatory oversight whatsoever, and that we are being subjected to inhaling and absorbing these brain altering concoctions almost everywhere, without our knowledge, and this seems pretty clearly the equivalent of drugging us without license or informed consent. They also neglected to discuss how their products have harmed and continue to harm the health of so many, and how their use creates barriers to access for people with disabling MCS/ES. and for those with health conditions like asthma and other breathing or respiratory difficulties, allergies, autism, learning difficulties, migraines, and more. Or that their substances wash down our drains and into waterways, where they harm wildlife and then come back into our drinking water, and that municipalities are not equipped to filter out all these toxic chemical pollutants. We have to pay for our own air and water filters if we don’t want to consume them. I’m not going to say much more about it here (I’ve said plenty already), so please go to the Women’s Voices for the Earth website, where you can learn more about this and other important issues, as well as ways to protect yourself, your family, friends, and even pets, (yes, pets are affected by toxic chemicals too) and then share what you learn with everyone you know! Be fragrance-free. It’s good for you, it’s good for me! It’s good for you! It’s good for me! This entry was posted in Air Quality, Environmental Health, Fragrance, Health, Human Rights, Pollution, Public Health and tagged allergies, asthma, autism, cancer, child health, drugs, endocrine disruptors, environmental sensitivities, fragrance chemicals, hazardous air pollutants, IAQ, MCS, multiple chemical sensitivities, petrochemicals, phthalates, toxic chemicals, toxic trespass. Bookmark the permalink. Very informative. 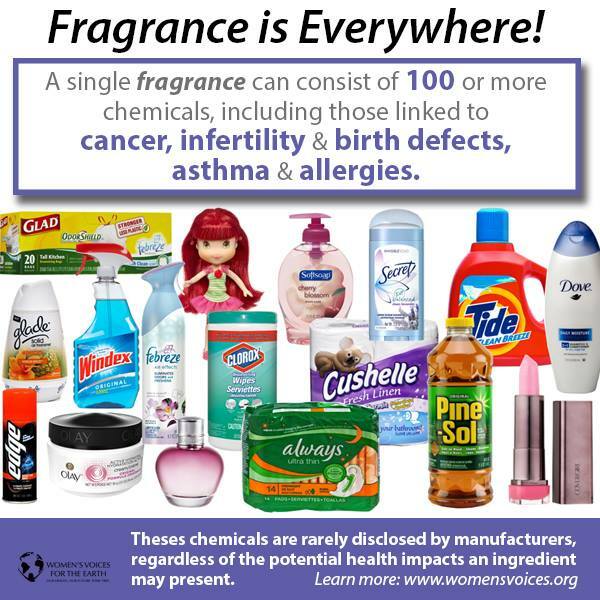 I hope some people are reading and understanding this besides those of us already disabled by toxic fragrances. I have to wonder though, if knowing is enough to break the addiction.